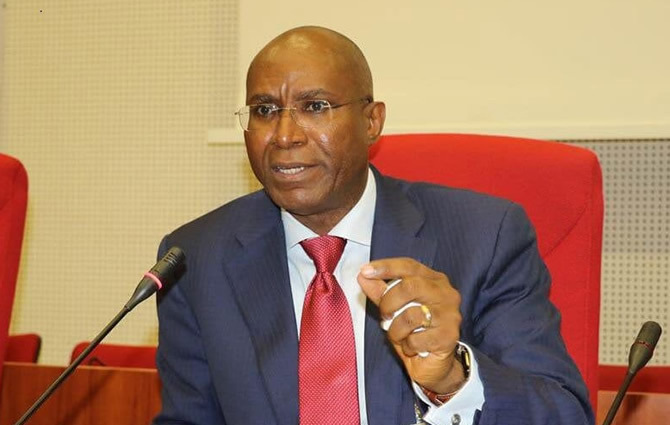 The All Progressives Congress member representing Delta Central Senatorial District, Ovie Omo-Agege, has finally laid to rest the report that a Federal High Court in Asaba nullified his emergence as the party’s candidate for the National Assembly elections. The senator told TheNewsGuru in an interview session that the court lacks the power to nullify his candidature because he was not a party to most of the plethora of lawsuits cited by the media on the APC crisis in Delta. His words, “Well, people need to understand that truly there are barrage of court cases, but in all of these cases (and I think there are about 17 or thereabout), I and my major opponent, Otega Emerhor are not a party to any of them except one. And what that implies is that in all of these cases where Otega and l are not parties, we are not bound by whatever decision taken in those cases. Not only are we not bound, he cannot as a non party seek to enforce the provisions of that judgement and neither can they be enforced against me since I’m not a party. “The only case that Otega Emerhor himself is a party, where my name was brought in came through the Warri Federal High Court, seeking a declaration as the plaintiff that he is the one who won the primary for the Delta Central senatorial election in 2019. That is the only case where Otega himself is a party and I’m made a party myself. Of course we went in there, we joined issues, we filed and adopted our brief and the court adjourned for judgement. Five days before the court was to deliver it’s judgement, Otega Emerhor (knowing full well that he was going to lose) tried to arrest the judgement by filing a notice of discontinuance but we say no. The laws are very clear, the moment issues are joined you can no longer seek to discontinue on your own volition. You require our consent and we are not giving that consent. Both section 293 and 285 of the constitution are very clear as to when a judgement in both electoral and non-electoral matters must be delivered. We stood against the arrest and sought to have the court deliver it’s judgement. And when if finally did, the court ruled that as regards the primaries for Delta Central senatorial district held on October 3rd 2018, the only primary that was conducted by the National Working Committee, the only committee recognized by law (both the constitution and electoral act) to conduct primaries, that the only primary they conducted which was supervised and monitored by INEC in accordance with section 85 of the electoral act produced a winner and that winner is not Otega Emerhor but Sen. Ovie Omo-Agege. “So between Otega and I, our issues are settled. That is the only litigation that has himself and I dealing with who the authentic winner of the Delta Central senatorial APC primary winner is. Every other court case that has gone or is ongoing has nothing to do with me and him. The case at the Federal High Court of Asaba whose judgement most media houses misconstrued was instituted by the factional chairman of the APC in the state, Cyril Ogodo and a few of his factional ward/local government chairmen. They sued the authentic chairman of the party in the state, Prophet Jones Erue, the national chairman of the party; they sued the APC as a party and also sued INEC. Those are the defendants. I am not there. There is nobody who contested for elections in Delta State that was joined in that case including Otega Emerhor. So when the court eventually made the decision, we told the court that we are not a party in the case before it and that the judgement cannot be binding on us. You can’t shave my hair in my absence. You must make me a party to the case to have its judgement binding on me. Let me also state that because I needed to protect the excos of the party, I went to the Court of Appeal seeking leave (permission) to be joined with the case and the Court of Appeal rejected saying I should have been joined from the Federal High Court where the case originated. That was the only issue that went before the Appeal Court. But the media went awash saying the Court of Appeal upheld the nullification of my election; an issue that was never before the court in the first place.